Invelos Forums: Missing / hidden profiles. I noticed some recent purchases were missing from the database, thinking I had forgotten to add them I tried to add them as usual by barcode. Each title came up as already in owned, bur I cannot find these titles anywhere. As I use the app when I am out film buying this is very annoying as I cannot remember if I have a particular title and use DVD Profiler to check, however with profiles missing I could easily rebut something I already own. Check in the Personal tab in Filters to see if you have any Exclusions set to Hidden. No, all filters are clear. I’ve added the missing items by title and all seems ok now. Now other profiles that I know were there are missing to. I’m disappointed as this programme used to be bullet proof, Burt seems less so now. It’s getting worse. Just added a manual entry for a dVDR, and checked it was in my collection. Added another manual entry and the first is gone. That isn’t available on the app. Done it on the pc several times. Hopefully yesterday’s update will fix this issue. is this sorted yet ? I still have a few missing on iOS , they say they are added but wont show up. E.h John Whick 4K . Tried deleting the database and re adding etc . nothing . which is in the Personal tab (not in Filters). 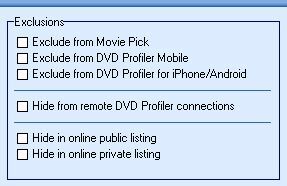 Have you made sure that the missing titles don't have Exclude from DVD Profiler for iPhone/Android checked? Can you see anything in common in the missing titles? Rating, for example, or anything else?